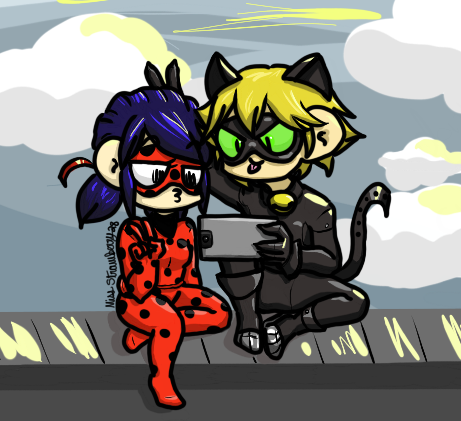 I need to get better at b a c k g r o u n d s But anyways, Ladybug and Chat Noir selfie! I made an ask blog on tumblr! Yoooo idk if it's bad to promote other websites here, but whatever ANYWAYS I made an tumblr ask blog for my OC Ribby the Skeleton (who may or may not based off someone irl) If you're interested, here's the blog: www.tumblr.com/blog/ribbythesu… Thanks!! Favorite visual artist GirlyTiara, Wifftins, Sheepyy, Rdaniels, BlackSpiralDancer1, etc. Favorite movies Suspenseful ones. Or romantic ones. Or comedic ones. Or horror films. Or all of the above. Favorite TV shows Steven Universe, Miraculous, Hunter x Hunter, FMAB, Assassination Classroom, Noragami, DuckTales, etc. Favorite bands / musical artists Sia and Panda Eyes Favorite books The Gemma Doyle series Favorite writers Libba Bray Favorite games G-mod, Skyrim, Legend of Zelda, Mario Kart (lol), etc. Favorite gaming platform PC, Wii, X-box, Switch Tools of the Trade Huion Tablet and FireAlpaca or Sketchbook Pro Other Interests Idek man, HxH has taken over my life. Hey! I remember seeing your art on the hunter x hunter subreddit. Your art is super cute! Oh gosh I FORGOT ABOUT THE REDDIT POSTS 藍 Thank you!! Hey there !! The voting journal for the youthbox valentines contest is up!